Fig. 1. GH-IIS axis and hepatic gene expression patterns in long-lived mice. 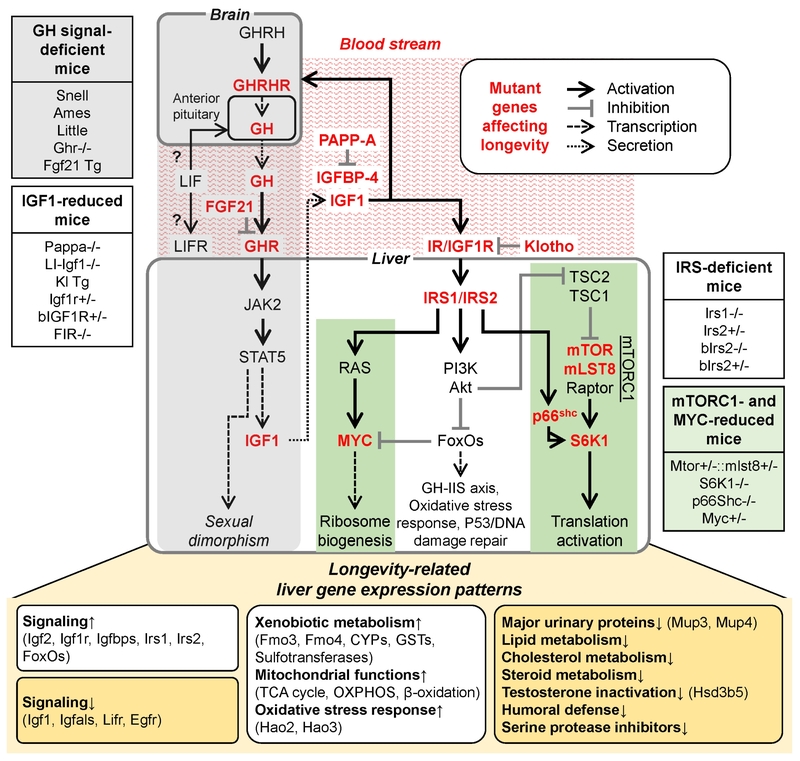 Components of the GH-IIS axis impact on hepatic gene expression and affect longevity. We divided GH-IIS axis genetically-modified mouse models into four groups: 1) GH signal-deficient mice with mutation at genes affecting GH production and GH signaling, 2) IGF1-reduced mice with homozygous and heterozygous mutation at genes involved in IGF1 production, including IGF1R and IR, 3) IRS-deficient mice including homozygous and heterozygous mutations of Irs1 and Irs2, and 4) mTORC1- and MYC-reduced mice with homozygous and heterozygous mutations for reduction of mTORC1 levels, lack of S6K1, p66Shc deficiency, and lower MYC levels. The target genes for long-lived mouse models are written in bolded red. Downstream liver gene expression patterns for longevity are displayed on the bottom panel.